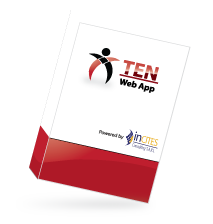 TEN is an online educational tool for university students and business executives that helps them understand the financial aspect of deploying a network. Its main goal is to help students understand the basic issues of techno-economic modelling and analysis. By implementing practical exercises, students become familiar with the main technical and financial parameters and indexes that affect the viability of telecommunications investments. Using TEN students are able to investigate the feasibility of two pre-defined scenarios: the deployment of a fixed FTTC and a mobile 3G network. The user avoids encountering complex algorithms (network dimensioning, depreciation, lifetime replacements etc.) which are built-in and running in the background but still manages to thoroughly understand the essence of the techno-economic analysis principals. TEN has dynamic and real-time characteristics. The study period of the project can be changed stimulating the automatic re-evaluation of the derived results. Students can also adjust the majority of the parameters (such as network dimensioning, demographic, service-related etc.) and observe, in real-time, their effect on the financial indexes of the project. Useful financial metrics, such as CAPEX, OPEX, revenues, cash flows etc. are evaluated and provided in a Profit and Loss (P&L) format along with their illustrative graphical representations. In addition, key financial metrics, such as NPV, IRR and payback period, are calculated enabling the deduction of robust conclusions regarding the viability of project’s investment. Users can obtain the required credentials using their social networking accounts (facebook, google+ and linkedin) or directly from the administrator. A user friendly interface has been designed for the administrator who can have a clear overview of the application’s users interaction with the tool. TechnoEconomics of Networks (TEN) webapp has been nominated as the best and most innovative solution from Luxemburg in the Learning and Science category. For more info, please feel free to contact us directly. The content of the site reflects a general description of the company as well as its activities. There can be no guarantee that such information will be accurate in the future. No one should use this information without prior permission of INCITES.